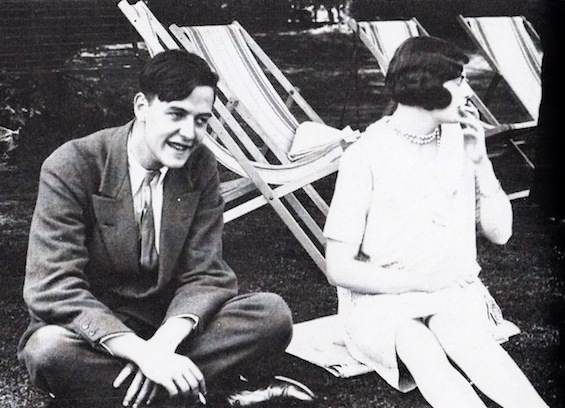 When did Evelyn Waugh first meet Diana Mitford? We don't know exactly, but Alec Waugh first met her at a party to celebrate the success of Decline and Fall at the Evelyns' Canonbury Square flat in November 1928. The place was heaving with the in crowd that day. 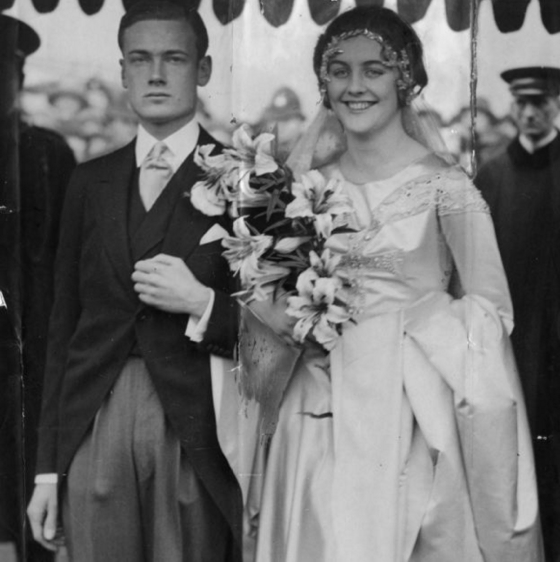 It was in January 1929, that the eighteen-year-old became Diana Guinness when she married Bryan, glass-jawed heir to the brewing fortune. 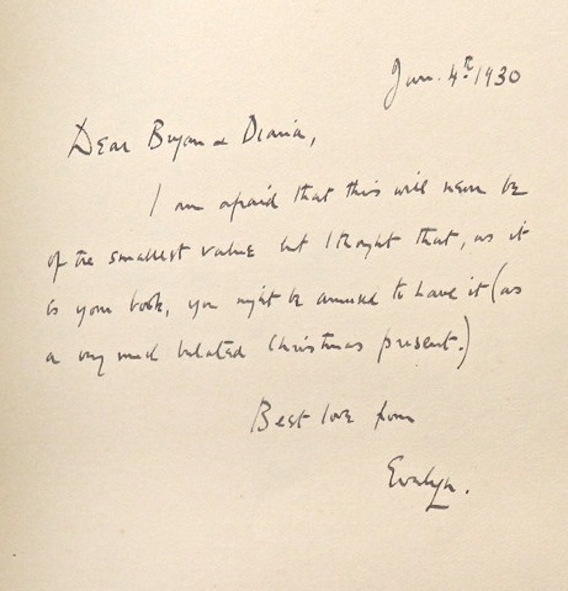 Around June 20, 1929, Evelyn wrote to Henry Yorke (Henry Green, author of Living) from the Abingdon Arms wondering if Henry was going to Bryan and Diana's party. That was the 1860 party which took place on June 25, possibly to celebrate Diana's nineteenth birthday of 17 June. 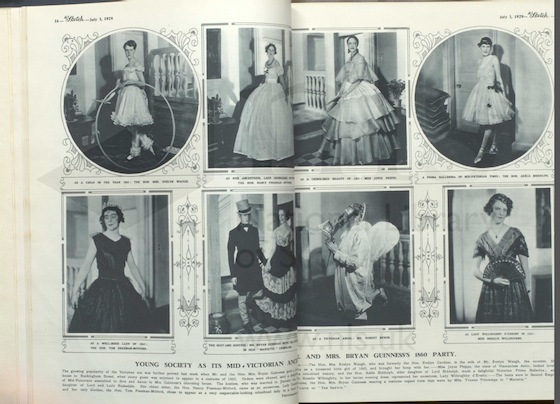 The Victorian party was significant because, even though he-Evelyn didn't go, she-Evelyn went with Nancy Mitford and was photographed in a dress that she then appeared in at another party on the Friendship later that night. In the fateful company of John Heygate. The party at Buckingham Street was commemorated in The Sketch with this double-page spread. With She-Evelyn top left and Diana with Bryan in the second picture from the left in the bottom row. That caption says it was a dinner dance. This is what 10 Buckingham Street (now 10 Buckingham Place) looks like these days. I suspect the dance floor would have been on the ground floor or the first floor. 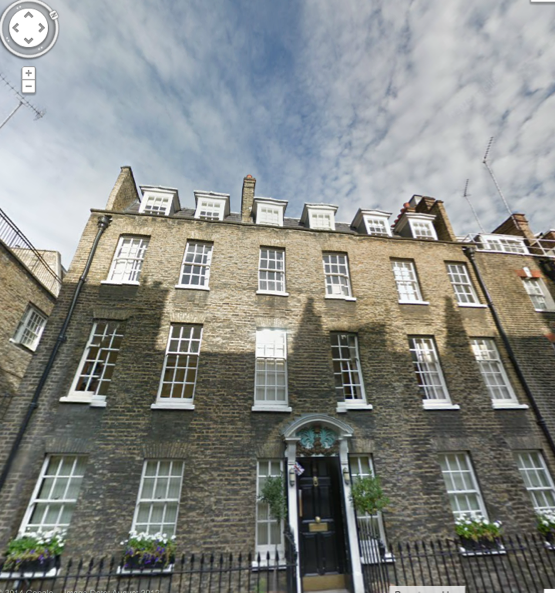 In her book, Loved Ones, Diana refers to this as 'our little house in Buckingham Street'. I think that's what's called getting things out of proportion. I expect such a massive space round the corner from Buckingham Palace would be worth 30 million quid now and full of Arab sheiks dancing with Russian oligarchs. How very un-1860. Diana and Evelyn were obviously sharing a joke then, in the middle of the Evelyns' attempted reconciliation, which lasted until a few days after the Bruno Hoax opening. Once the Eveyns had split, Evelyn was homeless. Only he wasn't exactly that, not with the number and quality of the homes that Diana had the keys to. 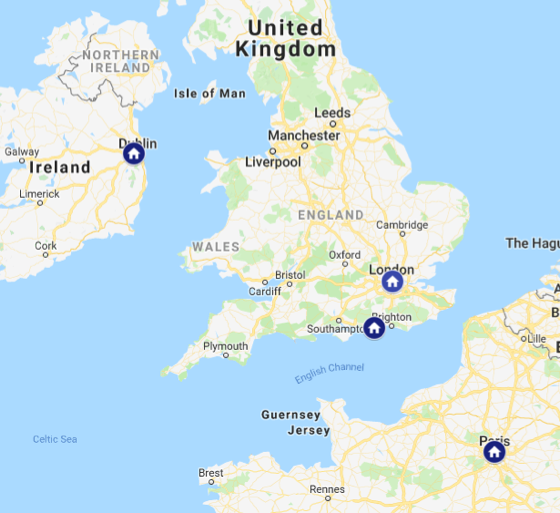 The map below shows the London town house, the castle near Dublin, the flat in Paris and the 'ugly little' house on the south coast of Sussex. Of course what Diana means by 'ugly little house' gets one's juices flowing, does it not?. The second of these homes that Evelyn got to know was the large house or castle near Dublin. Over in Ireland with Alastair Graham and Richard Plunkett Green to see the TT race near Belfast in mid-August, 1929 (which would inspire the longest chapter in Vile Bodies) Waugh went on to Dublin to stay with the Guinnesses. Again, there are very few pictures (if any) of this castle which is now demolished. When I get a suitable one I'll insert it below. At the moment, I don't know who else was of the party. This could be significant, as when a party was being arranged for August 1930, Evelyn Waugh was again asked. In 1930 the other guests were to include the Lambs, the Yorkes, Nancy Mitford and Lytton Strachey. More about that particular 'group' later in this essay. In September, While he was writing up the second half of Vile Bodies in The Royal George in Devon, he wrote to Henry Yorke saying that as soon as he had enough pages covered to call it a book he would join Bryan and Diana in Paris. He then praised Diana as being the one encouraging figure of their generation 'particularly now she is pregnant - a great germinating vat of potentiality like the vats I saw at their brewery'. 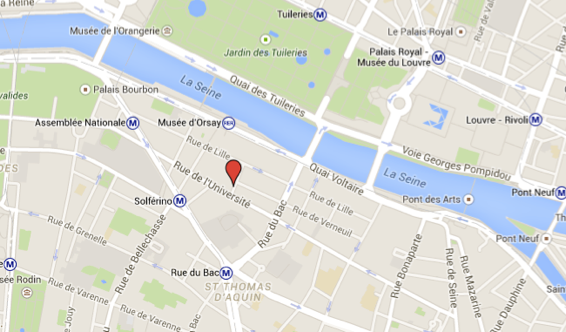 In October Waugh did get to Paris, staying at the Guinnesses flat, which is marked with a red tack on the map below. In the same flat, while pregnant Diana rested and read, Bryan was writing his first novel Singing Out of Tune (partly based on the Evelyns' split); Nancy was writing her first novel Highland Fling (elements were so like Vile Bodies that they had to be revised); and Evelyn himself was supposedly writing (possibly correcting proofs of Vile Bodies). In 2015. I took the opportunity of being in Paris for a few days with Kate to build up a picture of Waugh's life in Paris in October, 1929. He'd succeeded in finishing Vile Bodies, which was to be published in mid-January 1930. No doubt he felt he deserved a break before getting down to the hard work of writing up his near-disastrous Mediterranean cruise as a travel book, which he was contracted by Duckworth to do. A little like the set-up in 1928 then, when the Evelyns and Pansy were writing in rural Dorset and Henry Lamb was painting nearby. Henry and Diana, the non-writers in their respective foursomes. But cultured, indeed formidable, figures in their own right. And of course, Diana would become a journalist after the war and a writer of vivid memoirs in her later years. 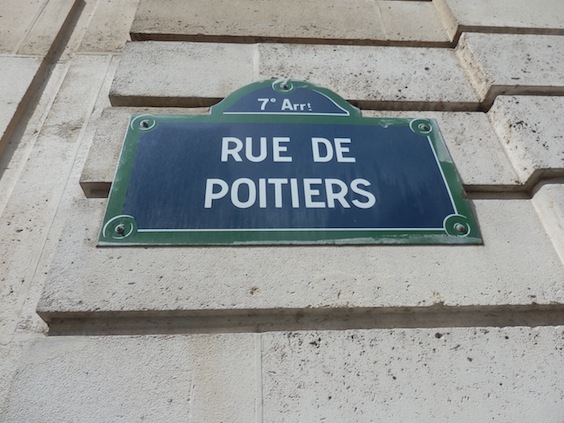 April, 2015. zeroing in on the Rue de Poitiers. Here it is, on the Left Bank, close to the Musée D'Orsay. 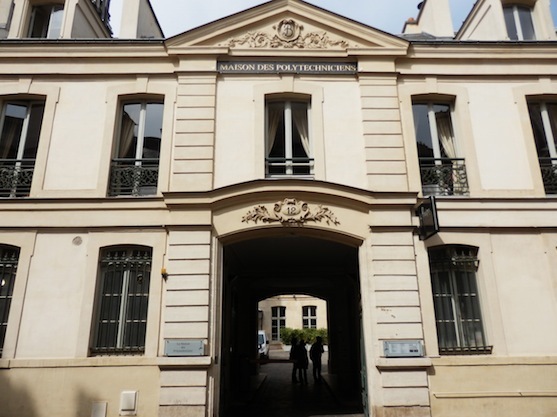 Within easy walking of the Louvre, the Arc de Triomphe, the Eiffel Tower and so much else. 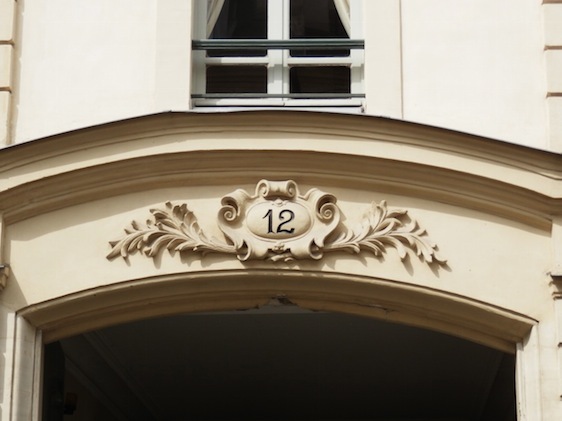 And here is number 12, Rue de Poiteirs. Then I stepped into the courtyard to get the next shot. The Guinness flat, in premises that covered two floors, must have been up to the right. 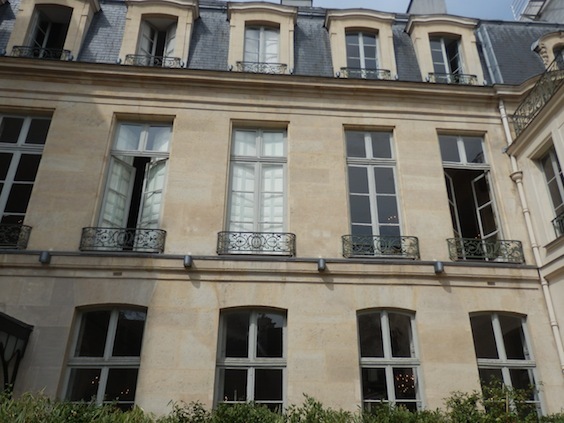 I say that because I've read somewhere that the windows (that's the ones on the other side of the block) looked towards the Seine. Prime real estate, just like their other Guinness properties. Note the pin-pricks of light on the ground floor that suggest chandeliers. Obviously Kate and I make our way into the building. For is Paris not our oyster just as it was Evelyn's and Diana's back in 1929? With all the elegance of a Diana Mitford/Guinness/Mosley, Kate leads the way. "How Evelyn must have loved getting to know Paris!" I suggest. "Did he write that awful travel book here?" "He may have begun Labels here, but I suspect not. He had articles to write and the proofs of Vile Bodies to correct. And he needed a break from writing. I think he just wanted to be around Diana's belly. And to explore the city." We keep seeing reminders of Diana everywhere we look. Kate is not a fan of hers, no more than she is of of Evelyn. She is all too aware that Diana's fascination for markedly clever men led her to a second marriage to Oswald Mosley, leader of the British Fascist party, and onto friendship with Adolf Hitler, who she described as a charismatic and fascinating man. I'm trying to stick to 1929, though one must always keep half an eye on the bigger picture. Hence I watched an interview Diana Mosley gave late in life where she admits that Hitler went on to do terrible things. 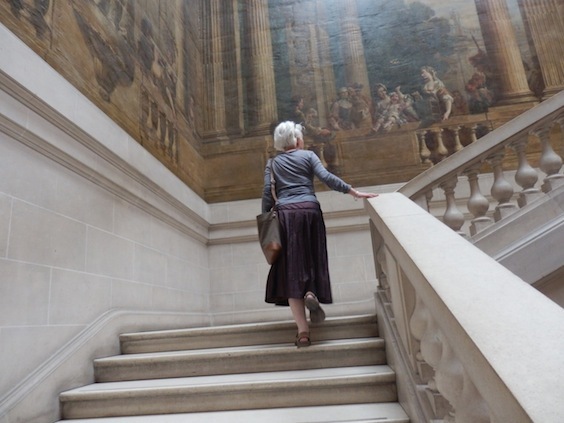 In her 1985 book, Loved Ones, Diana suggests that the thing Evelyn loved most about Paris was the Musée Grevin, which was a short walk north from the flat, past the Louvre and other classic beauties. In those days the Musée Grevin was like Madame Tussauds, only more horrible. According to Diana, Evelyn particularly liked the tableau of Christians being thrown to the lions. I can't find a picture of that. But here is one of Jean Paul Marat having been stabbed in his bath by a woman. That might have appealed to Waugh's sense of tragi-comedy at this time. For was he not a victim of domestic violence in the widest sense? Evelyn was with Diana much of October, November and December, either in Paris or the Buckingham Street house or elsewhere. There is yet another autumn letter from Evelyn to Henry Yorke from the inn run by Mr Fothergill at Thame, urging him to come and visit him there, and saying that Diana and Bryan had just left. Some of the time, Evelyn was living at his parents' house on Underhill Street, Golders Green. But he would travel each day to Buckingham Street to keep Diana company, while husband Bryan was reading for the bar. Evelyn took Diana to the zoo in Regent's Park, or to tea with his parents. This nourishing time was used by Evelyn when, eight years later, he wrote warmly about the pregnancy of Lucy Simmonds in Work Suspended. There are no photographs of pregnant Diana. There are very few photos at all of this phase of her life. Perhaps this picture from 1935 hints at her mythical attractiveness to Evelyn. That Christmas (1929), Evelyn went to midnight mass with Tom Driberg and then visited the Guinnesses on Christmas Day at the Buckingham Street house. Diana mentions that they gave away a dozen copies of Living by Henry Green/Yorke, and I read somewhere else that Evelyn was given a gold watch, which he treasured. Evelyn Waugh letter. Reproduced with the forbearance, I hope, of the Waugh Estate. I am afraid that this will never be of the smallest value but I thought that, as it is your book, you might be amused to have it (as a very much belated Christmas present). So Evelyn wrote Labels in an empty house on the south coast, a few miles along the coast from where in 1933 he would write his third travel book, Ninety-two Days in the empty house of another beautiful, platonic woman-friend, Diana Cooper. Apparently, Evelyn was fascinated by the work that was going on in neighbouring fields. Bryan's mother, Lady Evelyn Guinness, was having built a 'medieval' house, Bailiffscourt, complete with gnarled old trees which were transplanted. But Evelyn managed to ignore the absurd activity long enough to make a start to Labels. 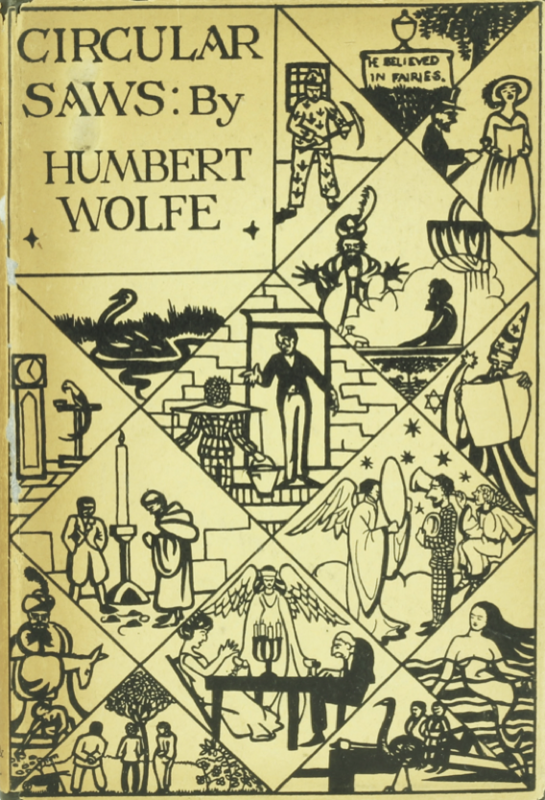 The final sentence of his paragraphs on artists' studios mentions that he came across a prettily decorated edition of the poems of Mr Humbert Wolfe. This would be the book, published by Chapman and Hall in 1923, for which Evelyn himself designed the dust-wrapper when he was a student at Oxford. What a self-referential travel book he was writing! As Selina Hastings tells us in her biography of EW, in Paris that autumn, Evelyn had met and was being energetically pursued by Marcella Gump, a one-time girl-friend of Alec’s, and daughter of a Chicago paint millionaire. Every evening she telephoned to ask him to go out. And with the Talbot-Rices as chaperones, all three would go ‘Gumping’, as they called it, drinking and dancing at Le Boeuf sur le Toit. So 'gumping' is a private joke. Just as in Vile Bodies he replaced the word 'divine' with 'sheepish' to fulfil a promise he made to Jessica Mitford, sister of Diana and Nancy, the resulting sentence mentioning a minor character's 'perfectly sheepish house in Hertford Street'. The first chapter of Labels ends with a three-page anecdote about Evelyn being mistaken for his brother in a Parisian night club. That is, a rich English woman, on being told that she was talking to 'Evelyn Waugh’ was ecstatic. He was the one person in the world she had been longing to meet! His books were by her bedside! Turns out she was thinking of Alec Waugh. So in a sense Evelyn is humbled. But of course, by the time that Evelyn wrote this scene, Vile Bodies was selling like hot-cakes and he could afford to seem self-deprecating. More of that later. On 19 February, Waugh told his agent that he'd written 30,000 words. Which suggest that he'd written the Monaco chapter and the ironically long Port Said chapter. In a letter of March 4, Waugh reckoned he would be sending the second half of the manuscript in another two weeks. He also suggested that he would be writing a biography of Jonathan Swift for Duckworths that year, instead of a new novel. That made sense, given Swift's life: his satirical bent, his wild humour, his imaginative faculty and his movements between London and Dublin, something that Waugh could echo through making use of the hospitality on offer at Knockmaroon. Diana and Bryan clearly liked the idea as they decided to name their child Jonathan when the baby was born in mid-March. As I said, Vile Bodies, published on 14 January 1930, was an instant success. It was in its seventh impression within seven weeks of appearing. Diana reckoned that it was about the beginning of March that she received a long letter from Evelyn, sent from Pool Place, telling her he'd just returned there from a jaunt to Oxford where he'd spoken at Lincoln College. 'Oh how bad my speech was! ', he felt he had to add, false-modest. Waugh adds that he'd put Diana's copy of Pastors and Masters back on the shelves at Pool Place, though if she'd rather have it in London he'd post it on. Clearly, Ivy Compton Burnett was flavour of the month, because in one of only two letters included in The Letters of Evelyn Waugh covering the first eight months of 1930, Evelyn urges Harold Acton to try Brothers and Sisters again, as Evelyn had just read it through twice and thought it magnificently humorous and well-managed. The letter to Diana (not included in The Letters of Evelyn Waugh because it was misplaced until 1980) ends with this: 'Boast. I was asked for my autograph by one of the assistants at Blackwells.' Clearly, Evelyn was revelling in his new found status of famous author. Little Jonathan was born in the middle of March, 1920, and Evelyn Waugh and Randolph Churchill were godparents. They met for the first time at the font. Pity they were still fonting around when the photo below was taken, though they do get a mention in the caption, along with three more godparents. When Labels was finished, Evelyn escaped to France. That's how Martin Stannard puts it, as it was a book that Evelyn hadn't enjoyed writing. On April 19 he met up with Alec in Villefranche, staying in the same hotel for five days. 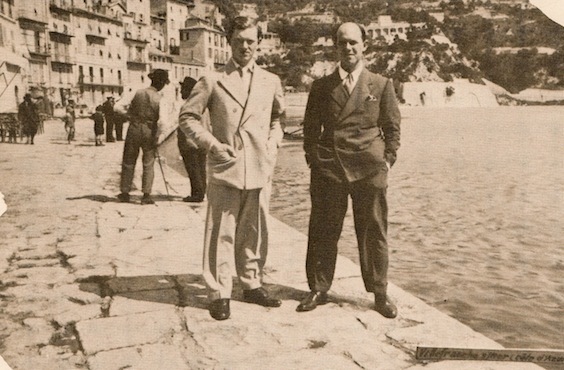 Evelyn Waugh and Alec Waugh, April 1930. The brothers then split up, Evelyn going on to Monte Carlo where he had invited Audrey Lucas to have a holiday with him. In January 1930, he'd met Teresa Jungman and had fallen in love with her. She wouldn't succumb to his advances, but one or two other women would, principally Audrey, and I tell her strange story in full on another page. In short, a talented woman who had difficulty getting her voice heard above all the shrill male shouting of the Twentieth Century. Back in England at the start of May, Evelyn resumed his diary on May 19, possibly because his social and professional life was becoming so busy and successful. Papers were offering him contracts and he was dining every day with the rich and the famous. We are approaching the climax of 'The Year of Diana', so I've pulled out all mentions of her in order to do this essay justice. Remember, she was no longer pregnant and at Evelyn's disposal, but out and about while (I very much suspect) a nurse looked after baby Jonathan. 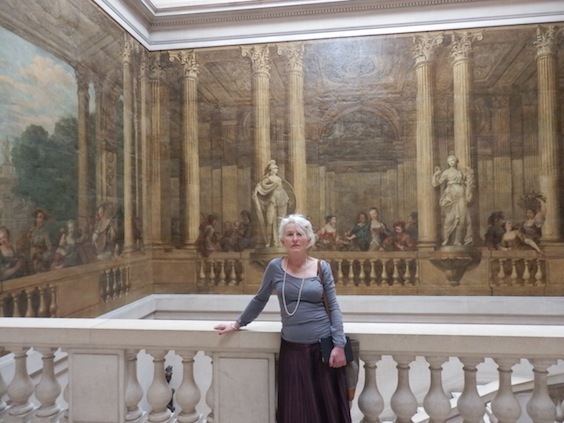 On Monday, Evelyn went to a supper party at Buckingham Street. On Friday he had tea there and the party went on to a cocktail party. On Saturday, he went to tea with Edith Sitwell. Diana was there ‘in a hat of the grossest eccentricity’. On Tuesday, Evelyn lunched at Buckingham Street. On Thursday, Harold Acton gave a cocktail party at Lancaster Gate. Diana was there, but not Bryan. Audrey Lucas was there and told Evelyn she was pregnant with his child. Evelyn purported not to mind, as long as it was a boy. On Friday he enjoyed a good luncheon with Bryan and Diana. After it he went with Diana to see the mask she was having made, cast by a German artist. She had promised Evelyn a copy in white and gold plaster. In Loved Ones, Diana states that she had allowed herself to be talked into having this done, 'a disagreeable proceeding and the result dead and mechanical'. Though it came in handy a few years later when she was in a car crash and a surgeon was able to reconstruct her nose with the help of the cast. On Tuesday. Evelyn lunched with Diana at Buckingham Street. On Friday Evelyn gave a luncheon party at the Ritz but ‘everybody’ chucked. Everybody being 'Baby' Jungman. Bryan and Diana were amongst the ten who did turn up. After the lunch, Audrey, Diana and Evelyn drove down to Pool Place. They had a ‘heavenly day on Saturday’, bathing in the morning and visiting Bramber Museum. 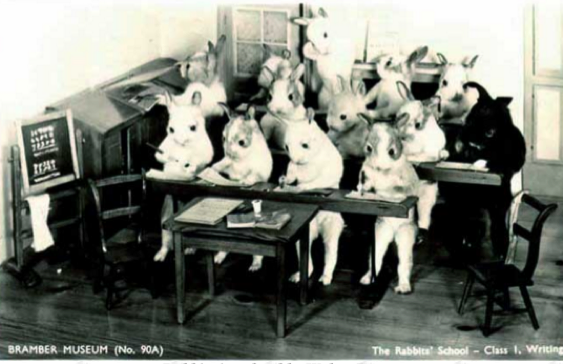 The Rabbits' School by Walter Potter. On Monday or Tuesday, Evelyn, Audrey and Diana returned to London by train and lunched at Buckingham Street. They also dined at Buckingahm Street, Bryan having joined the party. And they went to hear a talk by the American monologuist Ruth Draper before having supper at the Savoy Grill. Tuesday was Diana’s birthday. Evelyn gave her a bespoke umbrella from Brigg's ‘which she broke the next day’. On Thursday, Evelyn greatly enjoyed the cocktail party that Diana threw. In Loved Ones, Diana states that the tall, slender umbrella had an ebony crook handle with her name engraved on a gold band. She treasured it for many years, until it was stolen. And she kept the note that Evelyn sent her, which quoted Mr Brigg as saying: "Oh, how old-fashioned, it will be interesting for my men to make one like that." On Monday, Evelyn went to Birmingham and was taken round Henry Yorke’s factory which greatly impressed him. On Friday, Diana had a supper party at Buckingahm Street which he enjoyed, though he became very drunk and fought Randolph Churchill in the servants hall. On Saturday, for a peaceful weekend, Evelyn went to stay with the Lambs at their house in Coombe Bissett, Wiltshire. 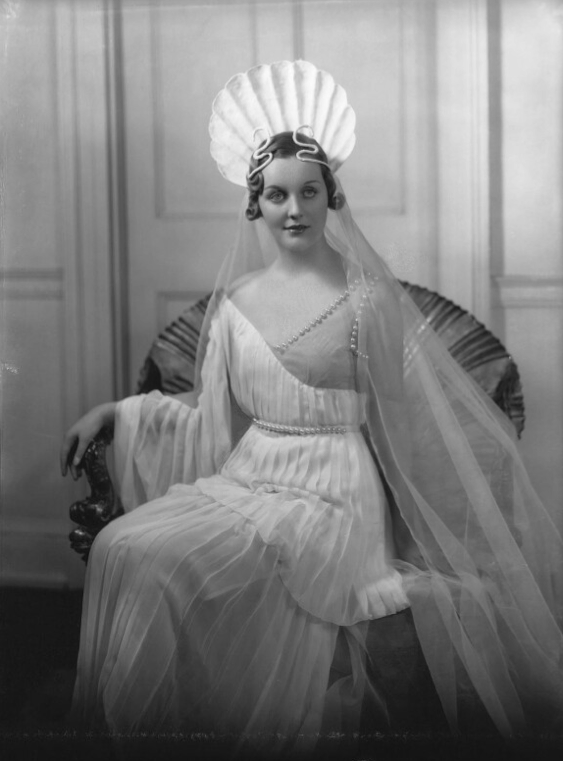 On Thursday, Evelyn noted in his diary what he called a very good example of the difference between Guinness and Mitford minds. A woman was very drunk at a dance. The father of Nancy and Diana (the Mitford mind) didn’t believe that women got drunk. And if a woman did get drunk, no-one would mention it. Whereas Bryan’s father (the Guinness mind) wondered how often she got drunk and what on. In other words, the Guinness mind was open, the Mitford closed. The day before, Evelyn had asked Olivia Plunkett Green if she could find him a Jesuit to instruct him. Possibly Evelyn had raised the subject of his proposed conversion with Diana (or with Nancy who he'd seen that very day) and got a negative response. 'A very good example of the difference between Guinness and Mitford minds. I was observed to be praying at Pool Place. Diana, on having this explained to her: "Praying. Don't be absurd. Evelyn simply doesn't pray. And even if he did no one would mention it." Bryan Guinness in similar circumstances: "Does he often pray?" A couple of photos were taken at Pool Place on Saturday July 5. Trees have been planted in the field, so perhaps this is where Baillifscourt was being built by Bryan's mother. I suspect Evelyn is in the same suit and tie he was wearing when the photo of him and Alec was taken in Villefranche. It's the only photo that I know of which features Diana and Evelyn together. Bryan Guinness and Pansy Lamb are also in the shot. 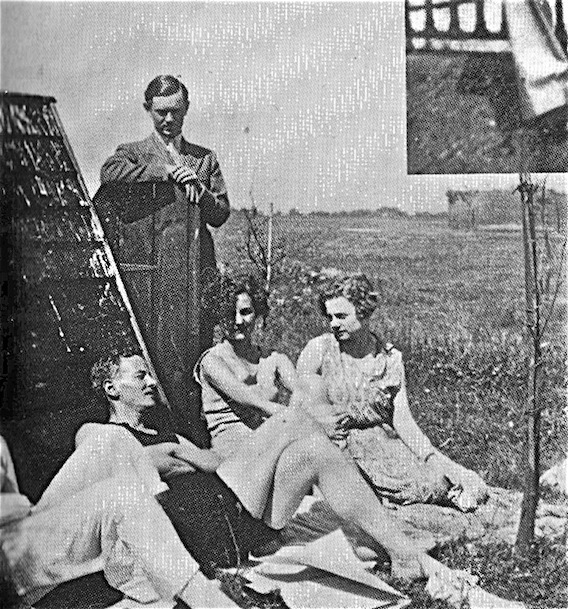 Evelyn Waugh and co by unknown photographer, 1930. Diana: "Praying. Don't be absurd. Evelyn simply doesn't pray. And even if he did no-one would mention it." Bryan: "Does he often pray?" Bryan: "How very interesting. What does he pray for?" Pansy: "Rain. So that Diana has to prove that she's not lost her Brigg's." Here is the other picture. 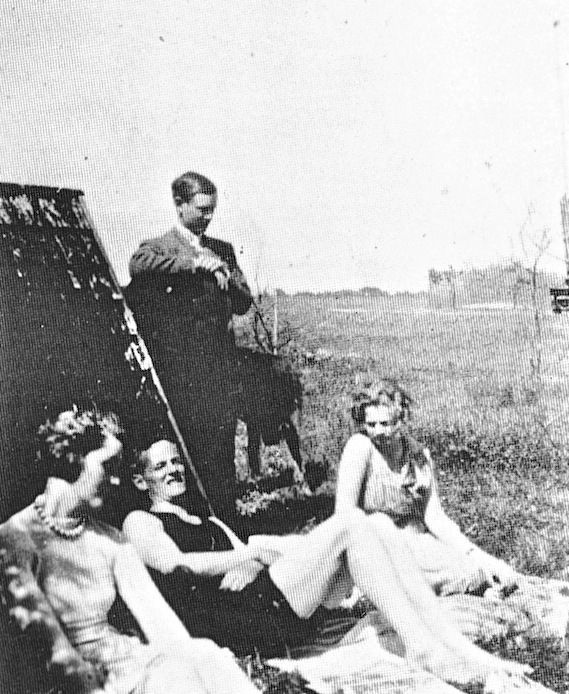 It's the only picture I know that features Nancy Mitford and Evelyn together, taken on the same occasion. Nancy: "Praying. Don't be absurd. Evelyn simply doesn't pray. And even if he did no-one would mention it." Pansy: "Rain. So that Diana has to go into the shed and see his Bramber." Dear reader, do you want to go into the shed and see Evelyn's Bramber? Or do you wish to pass on the chance to see mechanical toads? Yes, very wise. From then on, Evelyn was seeing Father D'Arcy regularly, and not Diana. At a cocktail party given by Cecil Beaton on July 9, Evelyn saw Diana but only said goodbye to her. On 17 July, after lunching with Father D'Arcy, Evelyn went to a party given by the Sutros. After the music, Evelyn drank a lot of champagne and sat with Bryan in the garden. Diana was friendly yet reproachful-looking. Waugh wrote her a note when he got home 'trying to explain that it was my fault that I did not like her, not hers'. Again, Diana kept the note. No doubt it will be in volume 32 of The Complete Works of Evelyn Waugh when it comes out. That's the volume of Personal Writings, edited by Alexander Waugh and Alan Bell, covering the years 1930-1935. Evelyn told Diana that he wrote two long letters and tore them up. All he was trying to say was that he must have seemed unfriendly lately and for that he was sorry. In the surviving note he asks her to understand that it's only because he's puzzled and ill at ease with himself. He assures her that much later everything will be fine. As I said earlier, that summer Diana invited Evelyn to stay again at Knockmaroon. The party was to consist of the Lambs, the Yorkes, Nancy and her beloved Hamish, and Lytton Strachey. All except the last were great friends of Evelyn. He admired Lytton Strachey, a member of the Bloomsbury set, but according to Diana, the latter was a 'new' friend and disapproved of as such. 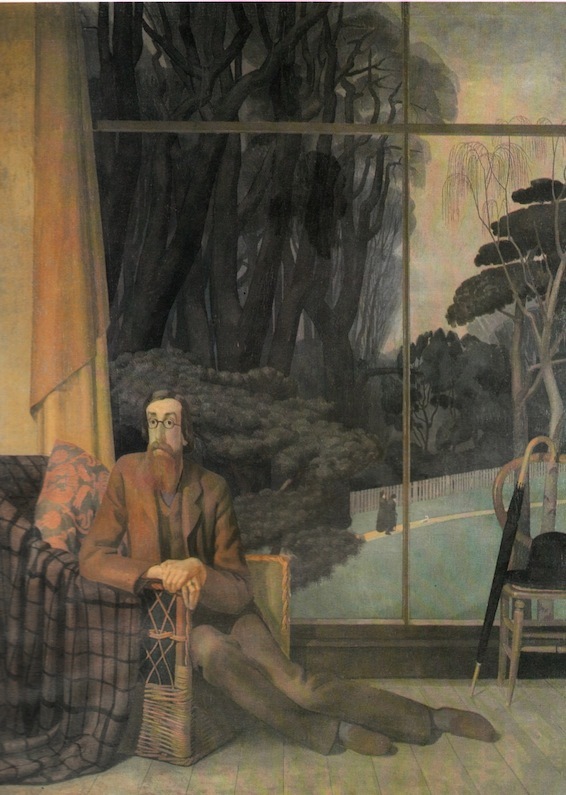 Henry Lamb had painted Lytton Strachey many years before, see below. One can't help admiring the sitter and painter both. Eccentric or what? It could almost be a piece of botched taxidermy by Walter Potter. Lytton Strachey by Henry Lamb, Oil on canvas, 1914. Only a few months before, Evelyn had expressed the wish that Diana would recuperate from childbirth at Knockmaroon. He would write his book about Swift and 'we would have fun'. In the same letter, Evelyn complained about the long hours he was having to sit for the portrait that Henry Lamb was painting of him. Commissioned by the Guinnesses and so featuring Evelyn drinking a pint of the brew. 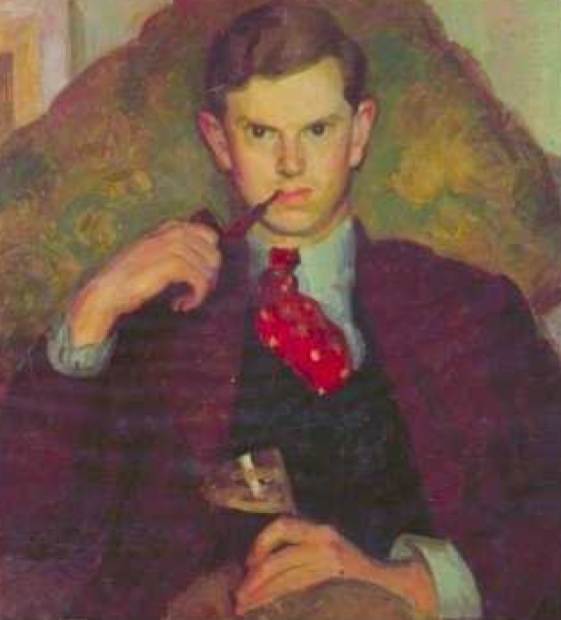 Evelyn Waugh by Henry Lamb, Oil on canvas, 1930. According to Diana the visit was a success because Lytton Strachey 'was so greatly appreciated by Henry'. But it's the sense of lost opportunity that strikes me. In 1928, Evelyn had been part of a foursome (including three writers) that included the Lambs. After the break-up with She-Evelyn he was part of another foursome (including three writers) that included Diana Guinness, Bryan Guinness and Nancy Mitford. In addition, Henry Yorke had been greatly admired by Evelyn since Living came out in June 1928, the book that the Guinnesses had distributed so many copies of at Christmas. 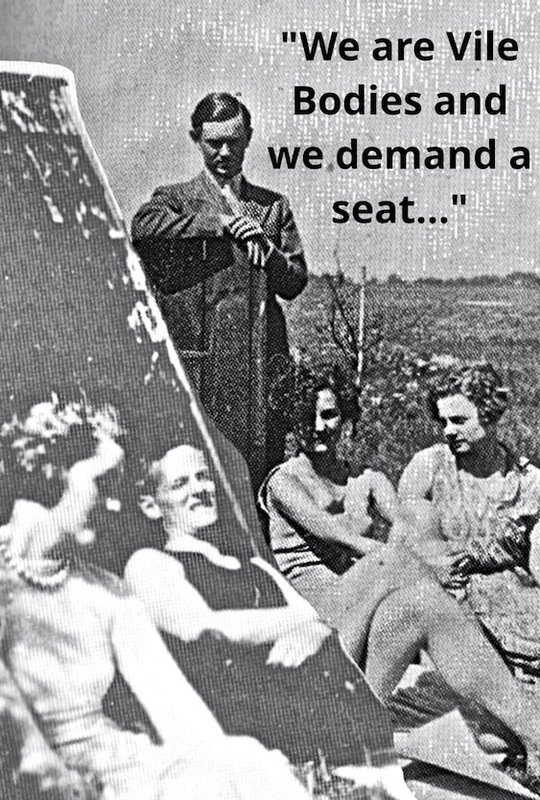 Waugh had a habit of collecting creative people around him. On June 23, 1930, a month or two before the declined Knockmaroon invite, Evelyn went to Birmingham for the day. After seeing Rossettis at the art gallery, he had lunch with Henry (Yorke) and then went on to his family's beer-bottling factory where he saw brass and iron casting. Evelyn was chiefly impressed by the manual dexterity of the workers. The brass casting struck him as peculiarly beautiful, green molten metal flowing from a red cauldron. Was there not the making of a group there? The Waughsbury Group, dare I say! Or perhaps, 'Vile Bodies'. As a group they could have gone from one Guinness home to another. Researching about Jonathan Swift while drinking gallons of Guinness in Dublin; keeping an eye on Picasso's domestic doings and his studio paintings in Paris; taking turns to engage with Henry's beer bottle factory in Birmingham; going to flapper parties in London; and writing books in splendid isolation at Pool Place. It's been said about the Bloomsbury set that although its members denied being a group in any formal sense, they were united by an abiding belief in the importance of the arts. Would the same have been said about Vile Bodies? Would their works and outlook have deeply influenced literature, aesthetics, criticism, and art, as well as modern attitudes towards feminism, class, and sexuality? Decades later, Waugh explained to Diana that he'd resented no longer being her exclusive companion, as he had more or less been when she'd been pregnant. As she'd embraced society again, Evelyn felt that he couldn't compete with the social and intellectual charms of Harold Acton and Robert Byron. But these two had been amongst the chosen few to be at the Evelyns' wedding. They respected Evelyn's gifts and could have been vital members of Vile Bodies. A chance missed? Because we know what happened. Evelyn went to Renishaw (stately home of the Sitwells) and got his ex-lover and old pal Alastair Graham to join him there. They went on to a non-Guinness house in Ireland and Evelyn decided to take Alastair's advice and go to developing Africa in search of a story. Waugh then ploughed a lone furrow for years. A devastatingly fertile furrow, producing Black Mischief and A Handful of Dust, but a lone furrow nevertheless. Without Evelyn, the rest of those people kind of lost their way. Henry Yorke didn't publish another book for ten years, despite the Brummy factory being at the disposal of his muse. Singing Out of Tune didn't do well, and though Bryan Guinness followed this up with two more novels they weren't thought highly of, and didn't sell. Pansy Lamb stopped publishing books after a follow-up to The Old Expedient called August, also published in 1928. Instead, she and the other Henry - who could have been official portrait painter of the Waughsbury Group - raised two children. Of course, the children of the Lambs, and the two that Diana had with Bryan, and any the Yorkes could have been persuaded to squeeze out on behalf of the team, would have become part of the Group as well. And their recollections and memoirs would have added to its mythology over time. But it wasn't to be. In Evelyn's absence, Diana soon found another unusually clever man, Oswald Mosley, leader of the British fascist party. And by the mid-thirties she was singing the praises of Adolf Hitler, for God's sake. She found him charming and fascinating, though, as I've said, she came to accept that he went on to do terrible things. The vilest body of all. Nancy Mitford's writing career only began to take off after the Second World War, by which time she was regularly corresponding with Evelyn Waugh again. He at Piers Court; she living in a flat in Paris. A group of two? Not the same as what might have been. 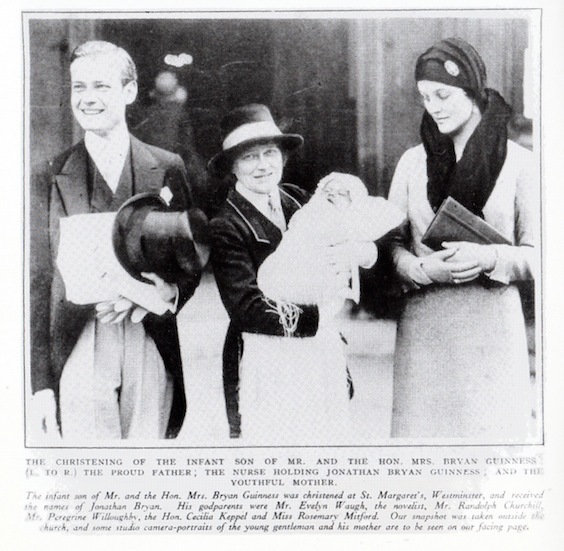 "...AT THE CHRISTENING OF BRYAN AND DIANA'S TENTH BABY." "...AT CECIL BEATON'S HUNDREDTH COCKTAIL PARTY." "...BESIDE NANCY MITFORD AND GAY HAMISH AT THE RITZ." "...AT HENRY LAMB'S ADELAIDE ROAD PORTRAIT STUDIO." "...IN THE BLAZING FURNACE OF THE OTHER HENRY'S BEER-BOTTLING FACTORY." "...ON THE AEROPLANE TO PARIS, COMPLETE WITH PAPER BAG TO BE SICK IN." No, I can't give Diana the last word. The last word has to go to himself. The real reason why Evelyn ditched these talented humanist friends, was that he could not come to terms with the loss of she-Evelyn. And he'd come to the conclusion that the only entity who could help him was God. 1) The interior of 12 Rue de Poitiers, corresponding to where the Guinnesses lived, as far as I can make out, is now a restaurant. 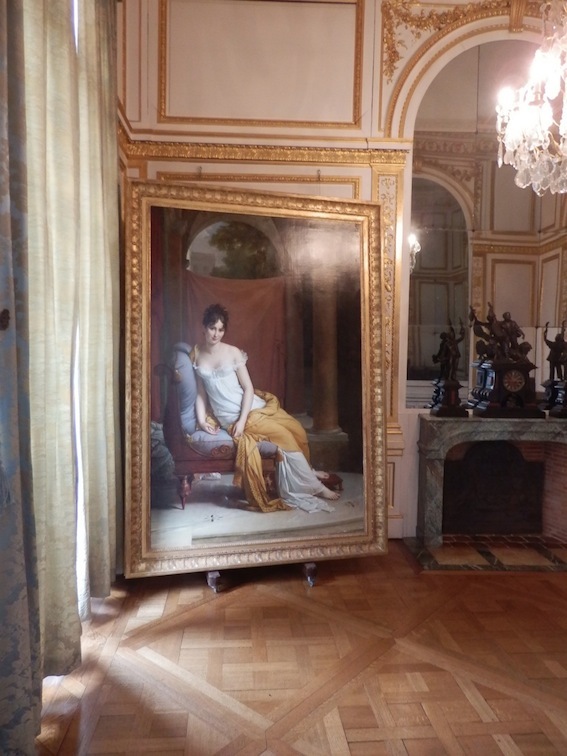 Those two pics of Kate and the one of a painting were taken elsewhere during our Paris break in 2015. Sorry to be confusing but it wouldn't do to be too documentary.